Dark Politricks: The Chilcot Report is out will Tony Blair face any real punishment? The Chilcot Report is out will Tony Blair face any real punishment? Now the Chilcot report is out, does this mean that the Tory Government have the balls to go and arrest Tony Blair for pushing the illegal Iraq war? Here was someone who knew that the evidence was false yet still promised George W Bush to be with him whatever, despite the UN and his own legal advisers, saying that the war was illegal. I doubt any Tories will do anything to put their establishment buddy Blair's head in the block as it would mean putting their own heads in as well. Many of them eagerly went along with the falsehood that many in the world knew was a blatant lie. It does however make sense why the Blairite push for power against their Labour leader Jeremy Corbyn was planned just before this week's revelations. They were hoping to take the sting out of the massive news story it will surely become, their own names off the front pages, and provide a different headline for the newspapers. However we must ensure that #Chilcot stays in the news and social media despite other political manoeuvrings. If we have to wait for the Blairites to return to the Labour fold and for Corbyn to get elected before seeing Blair in the Hague then we could be waiting a long time. However hopefully a massive class action case by the families of dead UK soldiers, and maybe millions of Iraqi's hurt by the war, could be formed to take him to civil court instead. Hopefully they could win and sting Blair with a massive monetary punishment as OJ Simpson was, to take away all the millions he has made since leading the country into Iraq by selling speeches, and pretending to be a "Peace Envoy". All whilst making money for himself in the Middle East advising dictators and lobbying the UN to vote against Palestinian statehood in 2011 - on the payroll of the Israelis no doubt. There is no one within the Palestinian leadership that supports or likes or trusts Tony Blair, particularly because of the very damaging role he played during our UN bid. He is considered persona non grata in Palestine. Although we can't prevent him from coming here, we can hopefully minimise the role he can play because he is not a mediator, he is totally biased on one side. So what were the main findings of the Chilcot report which we have had to wait 7 years for? There was no imminent threat from Saddam Hussein; The strategy of containment could have been adapted and continued for some time; The majority of the Security Council supported continuing UN inspections and monitoring. The UK chose to join the invasion of Iraq before the peaceful options for disarmament had been exhausted. Military action at that time was not a last resort. On 28 July 2002, the then Prime Minister Tony Blair assured US President George W Bush he would be with him "whatever". But in the letter, he pointed out that a US coalition for military action would need: Progress on the Middle East peace process; UN authority; and a shift in public opinion in the UK, Europe, and among Arab leaders. Judgements about the severity of threat posed by Iraq's weapons of mass destruction - known as WMD - were presented with a certainty that was not justified. Intelligence had "not established beyond doubt" that Saddam Hussein had continued to produce chemical and biological weapons. Policy on Iraq was made on the basis of flawed intelligence assessments. It was not challenged, and should have been. The circumstances in which it was decided that there was a legal basis for UK military action were "far from satisfactory". The invasion began on 20 March 2003 but not until 13 March did then Attorney General Lord Goldsmith advise there was on balance a secure legal basis for military action. Apart from No 10's response to his letter on 14 March, no formal record was made of that decision and the precise grounds on which it was made remain unclear. The UK's actions undermined the authority of the United Nations Security Council: The UN's Charter puts responsibility for the maintenance of peace and security in the Security Council. The UK government was claiming to act on behalf of the international community "to uphold the authority of the Security Council". But it knew it did not have a majority supporting its actions. Between 2003 and 2009, UK forces in Iraq faced gaps in some key capability areas - including armoured vehicles, reconnaissance and intelligence assets and helicopter support. Despite explicit warnings, the consequences of the invasion were underestimated. The planning and preparations for Iraq after Saddam Hussein were "wholly inadequate". The government failed to achieve the stated objectives it had set itself in Iraq. More than 200 British citizens died as a result of the conflict. Iraqi people suffered greatly. By July 2009, at least 150,000 Iraqis had died, probably many more. More than one million were displaced. The report sets out lessons to be learned: It found Mr Blair overestimated his ability to influence US decisions on Iraq; and the UK's relationship with the US does not require unconditional support. So will anyone apart from Jeremy Corbyn whose whole party seems to have deserted him despite having overwhelming support from the Labour membership and Trade Unions do anything about the lies of Tony Blair that led us to war and the creation of ISIS which haunts us all now? So no remorse then for the many people killed and injured from 2003 to this very day, all coming from his decision to back George W Bush who had some narcissistic desire to achieve what his father didn't in the earlier Gulf War, remove Saddam from power. This was despite any links to 9.11 or any evidence that he posed a threat to the region. This was a dictator that was supported by the USA during the 80's in it's war with Iran, and many in George W Bushes cabinet were players from that era such as Donald Rumsfeld who is seen here having a good time with his favoured dictator of the region. I have no doubt that the USA believed Saddam still had weapons of mass destruction because they used to sell him so many of them, including the nerve gas which he used against Iranian soldiers and Iraqi rebels. No complaint was made about it at the time of the event but when it came to the standard demonisation of the enemy before a war all this was put into the heads of the public to paint a horrible picture of their ex friend and enabled dictator. 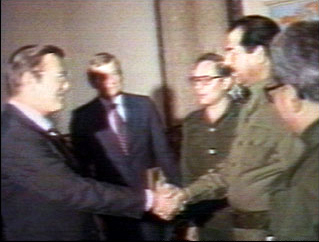 Despite warnings by the CIA that Iraq was using chemical weapons almost daily Donald Rumsfeld who was at the time a successful executive in the pharmaceutical industry, continued to make it possible for Saddam to buy supplies from American firms. This included biological weapons and viruses such as anthrax and bubonic plague. Also during the time the US was selling Iraq chemical and biological weapons the UK under Maggie Thatcher was selling up to 78 different types of military equipment including Land Rovers, tank recovery vehicles, terrain-following radar and spare tank parts according to released government reports. Apparently this pleased Maggie very much. She said she was "very pleased" with the "Contracts worth over £150m [that] have been concluded [with Iraq] in the last six months including one for £34m (for armoured recovery vehicles through Jordan)," which was written by a junior minister, Thomas Trenchard, in 1981. This letter also stated that meetings with Saddam Hussein "represent a significant step forward in establishing a working relationship with Iraq which should produce both political and major commercial benefits”. So not only did the UK and USA help stock up Saddam Hussein with all the WMD they then accused him of having, a very hypocritical move but to be expected by the two major powers in the axis of continual war, but we actually helped him use those weapons on Iranians. Iran was finally brought to the negotiating table by providing Iraq the location of Iranian troops, as well as the locations of Iranian logistics facilities and details about Iranian air defences once they had learned that Iran was about to gain a major strategic advantage in the 8 year long war. They were fully aware that Hussein’s military would attack with chemical weapons, including sarin and mustard gas prior to four major offensives in early 1988 that relied on U.S. satellite imagery, maps, and other intelligence. These attacks helped to tilt the war in Iraq’s favour and bring Iran to the negotiating table, and they ensured that the Reagan administration’s long-standing policy of securing an Iraqi victory would succeed. But they were also the last in a series of chemical strikes stretching back several years that the Reagan administration knew about and didn’t disclose. So not only were we totally hypocritical when dealing with Saddam helping him use WMD that we sold him in the first place, but we started a war of aggression against his country that was not thought out, had no plans for after the invasion, spilled over into sectarian violence and civil war and the formation of terrorist groups where there were none before. So how many dead people does Blair and Bush have on their hands from their decision to go to war "on faulty intelligence" or as normal people say "illegally"? -The US/ UN sanctions on Iraq of the 1990s, which interdicted chlorine for much of that decade and so made water purification impossible were responsible for over half a million deaths, mainly children. -The Illegal war which Blair promised Bush to support even though Saddam Hussein had nothing to do with it is thought to have killed at least half a million people. -The depleted uranium weapons used in Fallujah that are still causing babies to be born without legs and arms and horrible birth defects. -The long civil war came after the fall of Saddam between the Sunnis, Shia's and Kurds. -The forming of al-Qaeda in Iraq in 2004 when no al-Qaeda terrorists had existed before. -The forming of ISIS which is now fighting Iraqi, Kurdish, Syrian and Russian soldiers and inspiring terrorist attacks in the west. All whilst we do very little to stop them (and even support them) whilst allowing our ally Turkey to bomb the Kurds instead. -And that's not even counting all the dead US/UK soldiers. -And those who came home with missing limbs from IEDS and PTSD now living in poverty on the streets or in jail. I also wonder if the world has the strength to punish a war criminal that wasn't on the losing side for once? View the original article on the main site www.darkpolitricks.com.